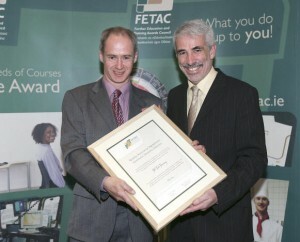 Paul Coughlan (Hi-Tech Training) Stan McHugh (FETAC) presenting FETAC certification award to Hi-Tech Training. 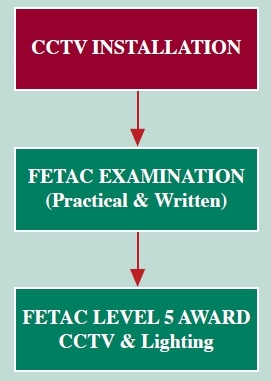 FETAC now known as QQI which the National awarding body for further education and training in Ireland. The Further Education and Training Awards Council (FETAC/QQI) gives people the opportunity to gain recognition for learning in education or training centres, in the work place and in the community. FETAC was set up as a statutory body on 11 June 2001 by the Minister for Education and Science under the Qualifications (Education & Training) Act, 1999. FETAC / QQI has responsibility for making awards previously made by BIM, Fáilte Ireland (CERT), SOLAS, NCVA and Teagasc and has made over 1,000,000 awards to date. 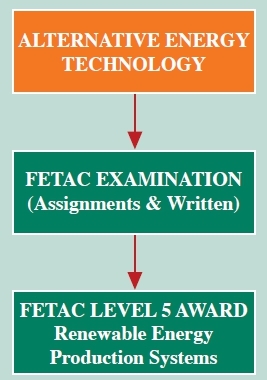 FETAC / QQI’s mission is to make quality assured awards in accordance with National Standards within the National Framework, creating opportunities for all learners in further education and training to have their achievements recognised and providing access to systematic progression pathways. People who successfully complete individual Hi-Tech Training courses receive Hi-Tech Training qualifications for each course successfully completed. On successful completion of a number of specific Hi-Tech Training courses participants may progress further to obtain FETAC / QQI National awards. Assessments takes place through practical skills demonstration and a theory based examination. On successful completion of both assessments facilitated by Hi-Tech Training, participants will receive a FETAC / QQI Award. The FETAC / QQI Award will state the result obtained, be it Pass, Merit or Distinction. Pass = 50%-64%, Merit = 65%-79%, Distinction = 80%-100%. 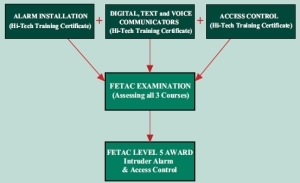 On successful completion of this course, participants may undertake a FETAC / QQI examination facilitated by Hi-Tech Training and on successful completion of same become eligible to receive the FETAC / QQI National Award – CCTV & Lighting FETAC Level 5 Component. This award can be used as one of the criteria for membership of the Security Institute of Ireland. criteria for membership of the Security Institute of Ireland. – Renewable Energy Production Systems FETAC/QQI Level 5 Component.